A hamster has been rescued after being found wandering on an Edinburgh street during a blizzard. 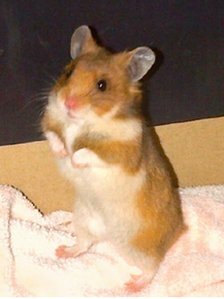 The female Syrian hamster was spotted by a member of the public on Spey Street, just off Pilrig Street, on Monday evening. Now named Poppy, the rodent is being cared for at the Scottish SPCA's Edinburgh and Lothians animal rescue and rehoming centre. It is hoped the one-year-old's owner comes forward. Duncan Robertson, of the Scottish SPCA, said: "Poppy is around a year old and in good condition. "It's very lucky she was found by someone who helped her as there was a severe blizzard on Monday evening and it was bitterly cold. "Poppy was found in Leith, which is a built up area with lots of flats nearby. Hamsters are fast creatures and can wriggle through small spaces so there is a chance she has escaped from home." Mr Robertson said they were keeping an open mind but could not rule out the possibility she may have been abandoned by her owner. "Poppy could have easily come to harm so we're really glad she's now safe," he added. "We're keen to hear from anyone who recognises Poppy and, in the meantime, we'll ensure she receives the care she needs. "If no-one comes forward, we'll be looking to find Poppy a loving new home."